Also serving communities of Naches. There are 11 Assisted Living Facilities in the Yakima area, with 10 in Yakima and 1 nearby. The average cost of assisted living in Yakima is $3,993 per month. This is higher than the national median of $3,346. Cheaper nearby regions include Ellensburg with an average starting cost of $3,165. To help you with your search, browse the 41 reviews below for assisted living facilities in Yakima. On average, consumers rate assisted living in Yakima 4.5 out of 5 stars. Better rated regions include Sunnyside with an average rating of 5.0 out of 5 stars. Caring.com has helped thousands of families find high-quality senior care. To speak with one of our Family Advisors about assisted living options and costs in Yakima, call (855) 863-8283. In 2015, Yakima won its second All-American City award. The city’s presentation focused on keeping children engaged and freeing the city of gangs. With gangs in the picture, Yakima does have some issues that may concern senior citizens seeking assisted living. However, it can be appealing due to its dry climate and small-town ambiance. Seniors in Yakima have 10 facilities to consider, all licensed by the Washington State Department of Social and Health Services, Aging and Long-Term Support Administration. Each facility in Yakima must provide room and board to at least seven residents and provide help with the activities of daily living. The crime rates in Yakima might give seniors the most pause about choosing this city. The violent crime rate is 44.3, compared to the national average, 31.1. The property crime rate is 70.3, while the national average is 38.1. Seniors may want to inquire about safety and security at assisted living facilities they are considering in Yakima. Yakima scores 71 out of 100 on Sperling’s Comfort Index, with 100 reflecting the ideal comfortable climate. In comparison, the U.S. average is 54. Yakima doesn’t get much rain, only nine inches per year, and receives about 20 inches of snow. The overall cost of living in Yakima is below national and state averages. Seniors may pay a bit less for housing, health care and utilities in Yakima than in other areas of Washington. The air quality in Yakima scores 40 on a scale of 1-100. By comparison, the national average is 58. Yakima’s proximity to wildfires is a big contributor to the somewhat low score. Seniors should follow any air quality alerts and take measures such as staying indoors when advised to minimize the effect of poor air quality on their health. Yakima Transit runs bus routes throughout the city seven days a week, and seniors 62 years and older can qualify for reduced fares. As of 2018, senior riders can get a monthly pass for $9 and enjoy unlimited rides. Yakima has several things going for it on the arts and culture scene. The Yakima Valley is part of wine country, and seniors can catch performances at venues such as the Capitol Theatre and The Seasons Performance Hall. There are also casinos, art galleries and a symphony orchestra. Assisted Living costs in Yakima start around $3,993 per month on average, while the nationwide average cost of assisted living is $4,000 per month, according to the latest figures from Genworth’s Cost of Care Survey. It’s important to note that assisted living rates in Yakima and the surrounding suburbs can vary widely based on factors such as location, the level of care needed, apartment size and the types of amenities offered at each community. 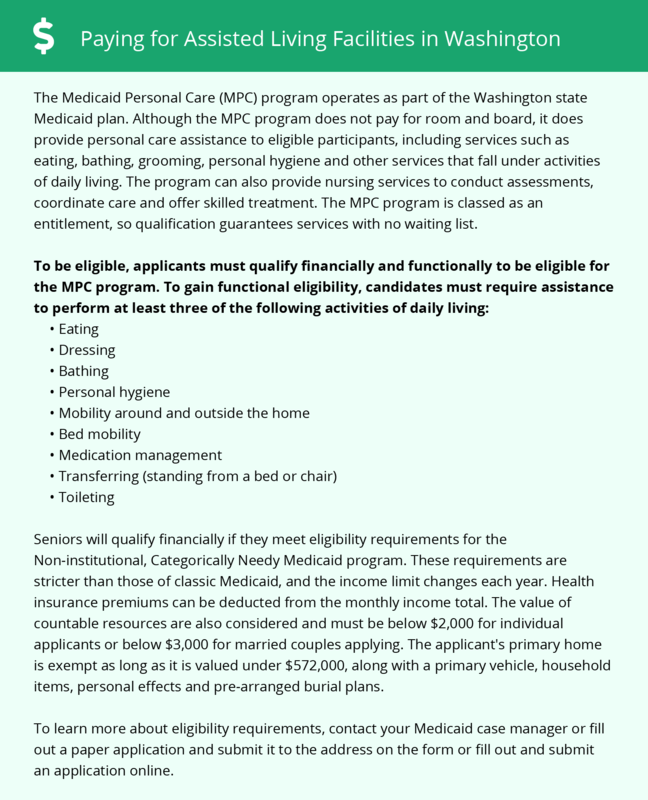 Four programs in Washington may help Yakima residents who qualify with assisted living costs: New Freedom, Community First Choice, COPES and Medicaid Personal Care. To see a list of free assisted living resources in Yakima, please visit our Assisted Living in Washington page. Yakima-area assisted living communities must adhere to the comprehensive set of state laws and regulations that all assisted living communities in Washington are required to follow. Visit our Assisted Living in Washington page for more information about these laws.